JUVÉDERM® Injectable Gel Ultra is a colorless hyaluronic acid gel that is injected into facial tissue to smooth wrinkles and folds, especially around the nose and mouth. Hyaluronic acid is a naturally occurring sugar found in the human body. The role of hyaluronic acid in the skin is to deliver nutrients, and hydrate the skin by holding water in and to act as a cushioning agent. JUVÉDERM treatments are popular with women and men from Hermosa Beach, Redondo Beach, Torrance, and other South Bay communities because it instantly adds volume to facial tissue and restores a smoother appearance to the face. The Spa at South Bay Plastic Surgeons specializes in JUVÉDERM and other minimally invasive facial rejuvenation treatments. For a personalized treatment plan, request a consultation online or call us at (310) 784-0644 and we will schedule your appointment. The size of the hyaluronic acid molecule and the degree of cross-linking are what affect this innovative product’s longevity. JUVÉDERM injectable gel uses proprietary HYLACROSS™ technology to create a smoother filler that lasts longer and is more stable than other hyaluronic acid products. The side effects and discomfort are similar to other injectables. Temporary redness and possible bruising may be seen. There may also be tenderness at the site for a day or so. 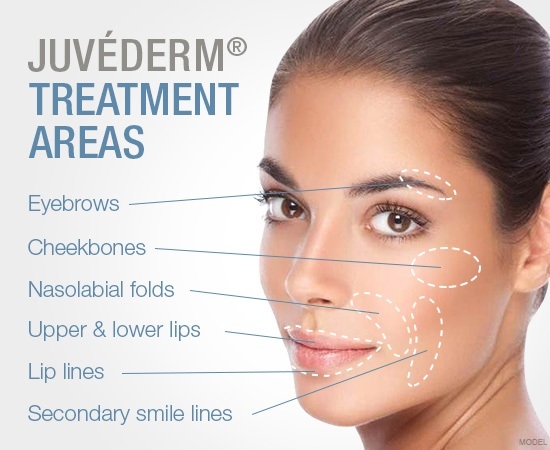 One notable difference with JUVÉDERM is you may not see as much swelling as you might see with other fillers. JUVÉDERM gel is an effective treatment for facial wrinkles and lines. When combined with JUVÉDERM VOLUMA® XC, which is approved by the FDA to give the cheek area a lifted appearance, the results are remarkable. Additionally, JUVÉDERM VOLBELLA® is formulated specifically for lip augmentation and fine lines around the mouth. Using more than one injectable can produce remarkable results when the goal is to minimize fine lines, deeper wrinkles, and sunken cheeks. JUVÉDERM gel used with JUVÉDERM VOLUMA® XC, which is approved by the FDA to give the cheek area a lifted appearance, helps make facial rejuvenation more comprehensive. It’s also possible to use BOTOX® Cosmetic and fillers during the same appointment. BOTOX is best for reducing wrinkles around the eyes (crow’s feet) and the “worry lines” that develop between the eyes.